A case study of spatial injustice between urban form, risk exposure, adaptive capacity and sensitivity. Rapid urbanisation steadily increases the importance of sustainability in urban planning while it equally contributes to rising spatial injustice, mostly in sub-Saharan Africa: Access to land, services, employment opportunities and therefore the city itself varies strongly between different income and social groups. These gaps are significant and disadvantage the already most marginalised groups even more, and are increasing, specifically under the growing threat of climate change and its accompanying risks. The understanding thereof as well as realising which factors influence spatial justice is crucial for tackling these inequalities. A case study in Kampala is undertaken to examine these dynamics further. This research intends to increase the understanding of spatial justice in the field of climate change vulnerability to support betterinformed policy and spatial intervention strategies with a particular focus on flood-related risks. Starting from this broader context and in order to answer the central question how floods shape Kampala's urban gestalt and vice versa, a quantitative method is developed to measure the urban form, as well as the distinguished components of social vulnerability; namely risk exposure, adaptive capacity and sensitivity. The collected and analysed data is supported with several expert interviews from Kampala, an online survey and field observations. 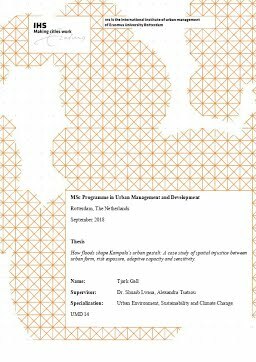 The objective is an improved understanding of urban dynamics, justice, and accessibility to build a better foundation for informed policy decisions and spatial interventions. The thesis results in two principal outcomes: (1) A variety of high-resolution visualisation of the current situation of urban form and social vulnerability through 64 individual and aggregated indicators; and (2) correlations between urban form and social vulnerability, as well as its constituents, and carefully selected individual indicator pairs. Furthermore, the characteristics of urban form and social vulnerability are investigated for marginalised groups of the urban society. The applied method proves several initial presumptions from existing literature, as well as current academic theories, and results in the sound confirmation of the impact social vulnerability and urban form can have on each other, and the manifested spatial injustice. However, the findings do not just show today's complex interplay but also bring underlying developments and deeply enrooted injustices to light. Even if the results are contextspecific, general conclusions apply to other urban areas and add to a more comprehensive understanding of spatial injustice in sub-Saharan African cities, while the developed and applied methodology bears a magnitude of potentials for further research in more detail and varying environments.